So, a while back I saw this video from Biohazardous Beauty where she used a bunch of My Pretty Zombie eye shadows, and I just fell so much in love with the colours and how unique they are, that I had to try them for myself. So I ended up settling for 9 shadows (I easily could have bought twice as many and still feel like I wanted more). When I got the package there were so many goodies in it (as you can see in the first picture) – 3 samples, a Vince’s High Six Hand Cream (I’m told it smells like candy), a pin, and a sticker, as well as the store business card. Top row, L-R: Black Eye, Murder, New Bruise. Middle row, L-R: The Vapors, Epistaxis, Rash. Bottom row, L-R: Brisket, Tenderloin, Fresh Scab. Honestly these names are so fun and on brand, it’s so cool. 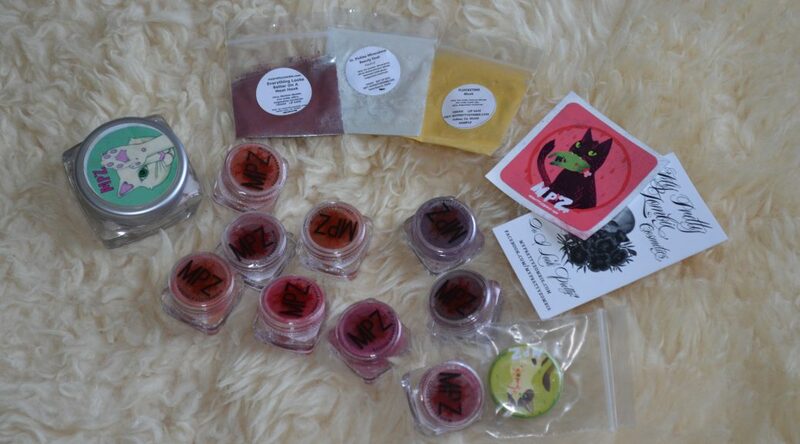 A bunch of the colours in the store are made with special effects makeup in mind, which is totally cool – a few of the ones I got I see being used for bruises, or scabs or something like that. The colours look really pretty in the pan, but also kind of daunting, so I haven’t gotten around to use them very much in the time I’ve had them (and I’ve had them for almost a year now). 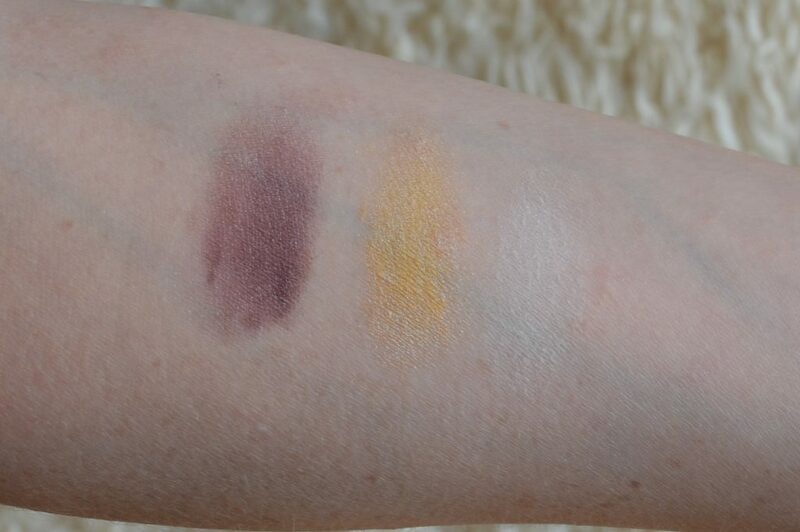 Plus the swatches look really different for some of them (notice how purple the New Bruise shade look in the pot, and how blue it is in the swatch below), so I think having these swatches will help me use the colours more in the future. 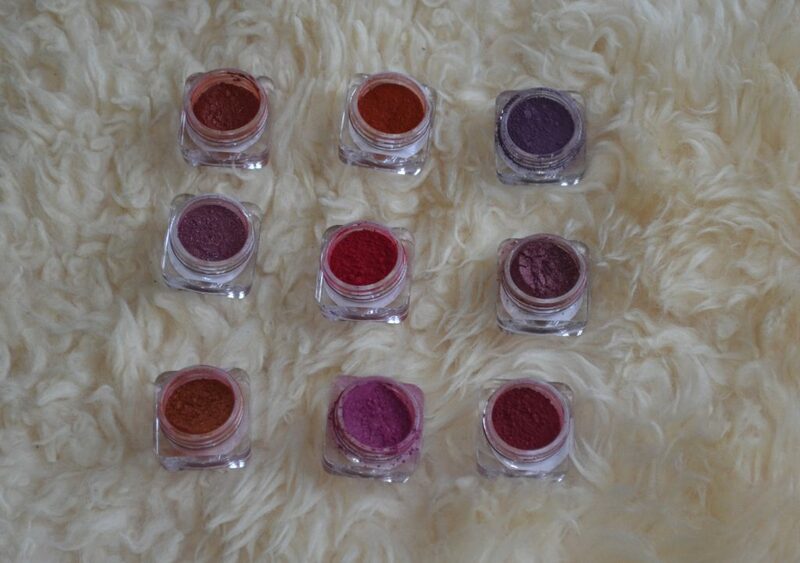 The swatches look so pretty! (please excuse the slightly sloppy swatching – it’s my first time swatching loose powders). I think my top 3 at the moment, colour wise, is Brisket, Rash and Epistaxis. Though you need to be careful not to overblend Brisket, since it will lose all its gold colour and just turn red (still pretty, but a very different effect). The swatch for Tenderloin looks very different from what I can find on google – mine is brighter and more lilac-y where the pictures on google is a dark maroon type colour. I think this is because my swatch is not blended out – the more you buff and blend the shimmer colours the more shimmer and brightness disappears, so that might be why. Or it could be the natural lighting I take my pictures in. I also really love Fresh Scab – such a beautiful deep red colour. Swatches L-R: Everything Looks Better on a Meat Hook (eye shadow), Fluoxetine (blush), and Dr. Pickles Miraculous Beauty Dust (setting powder) in neutral, in indirect light. Swatching the samples are a lot more difficult, since they are in little bags, so you can’t really get enough on your finger to give a good impression. 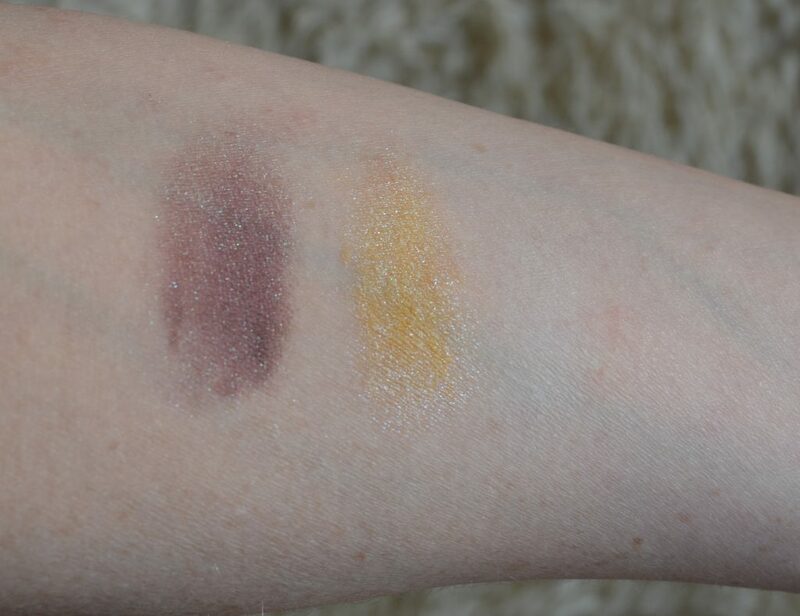 Swatches L-R: Everything Looks Better on a Meat Hook (eye shadow), Fluoxetine (blush), and Dr. Pickles Miraculous Beauty Dust (setting powder) in neutral, in direct sunlight. In the direct light you can see a bit more of the sparkles in the eyeshadow and blush, but the setting powder almost disappears. The eye shadow looks really interesting, but the blush I’m not really sure when I would use it – yellow blush is a really interesting choice, but not really an every day colour. The setting powder looks cool, but I don’t think there is enough in the sample to more than a single use – but it feels pretty silky, so I might try out a larger size if I buy more from the store.